The "Lysts on the Lake 2013" jousting tournament consisted of three days of competition, October 31 - November 2. The tournament involved five sessions of Tilting(what most people consider the actual jousting part of a jousting tournament), a Chivalric Equitation Obstacle Course(Mounted Skill at Arms course) and a Mounted Melee. There were 9 jousters who participated in all three competitions and were therefore eligible to win Tournament Champion. Based on the points he earned during these three competitions, Jeffrey Basham of Katy, Texas, was declared the overall Tournament Champion for "Lysts on the Lake 2013". Jeffrey is an extremely modest man who wanted to make sure that the horses he rode during the tournament were given their due credit for his win. 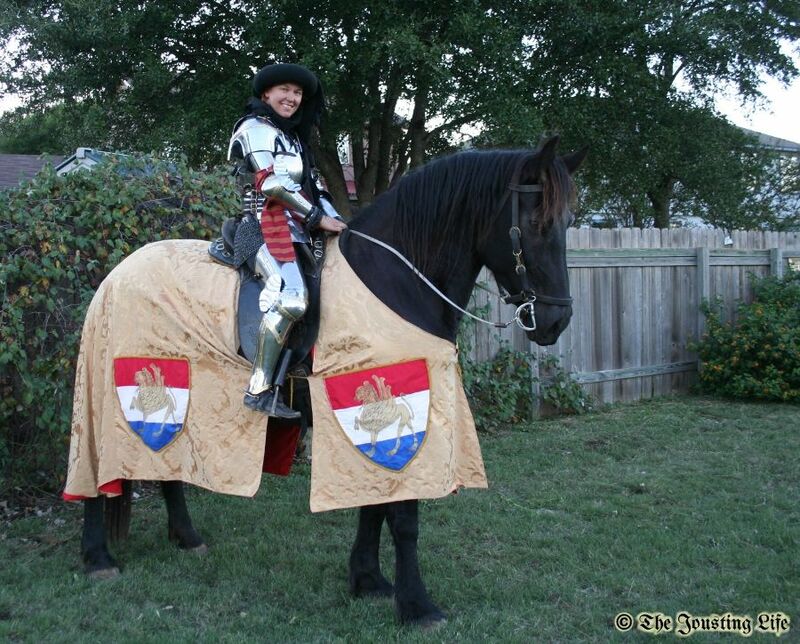 Without the partnership of a capable and willing horse, no jouster would be able to compete. Throughout most of the tournament, Jeffrey rode Pooh Bear, his own quarter horse mare. However, on the last day of the tournament, Pooh Bear lost a shoe and could no longer be ridden until her shoe was replaced. In an act of friendship and good sportsmanship, fellow competitor Scott Wilson loaned Jeffrey his appaloosa gelding, Tanner, so that Jeffrey could continue to compete. Riding Pooh Bear, Jeffrey won the Chivalric Equitation Obstacle Course(MSA course) on Friday. You can see the video of their run in a previous article. Jeffrey also won the Tilting competition. Jeffrey rode Pooh Bear for the first four sessions of Tilting, then rode Scott Wilson's gelding Tanner for the fifth and last session. It is much easier to joust consistently if you ride the same horse throughout the tournament. Switching horses, especially switching to a horse that you have never ridden before, makes things much more challenging. Though Jeffrey did say that Tanner had the smoothest canter of any horse he had ever ridden. The fourth and fifth sessions of Tilting were held on Saturday during "Fable Fest" at Milburn Park in Cedar Park, TX. The Mounted Melee portion of the competition was also held at "Fable Fest" between the fourth and fifth sessions of Tilting. 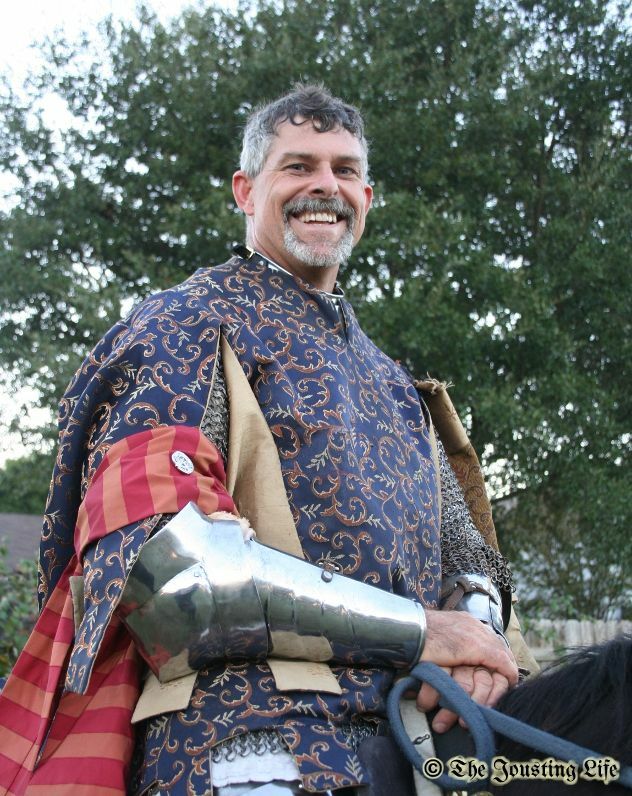 Dave Wise of Houston, Texas, won the Mounted Melee portion of the tournament. Throughout the competition, Dave rode his new mare Nocona. 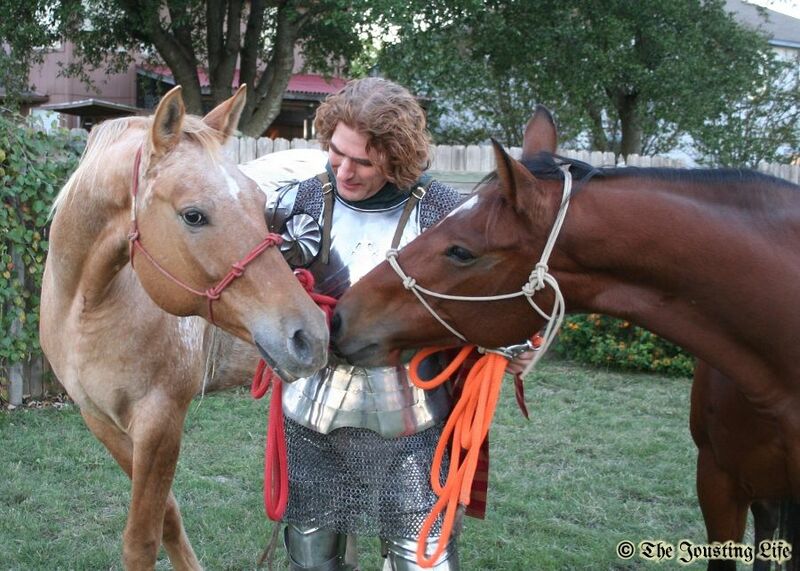 Nocona had never actually competed in a jousting tournament before. In fact, the very first time she had a lance broken against her rider was during the warm up Thursday morning before the first Tilting session. That she did so well throughout the tournament is a testament to both her and her rider. Many jousting tournaments also have a special award that is not based on points, but is instead based on the quality of character that a competitor displays during the course of the tournament. Some jousters consider this award – the Award of Chivalry – to be more important than any other tournament prize. 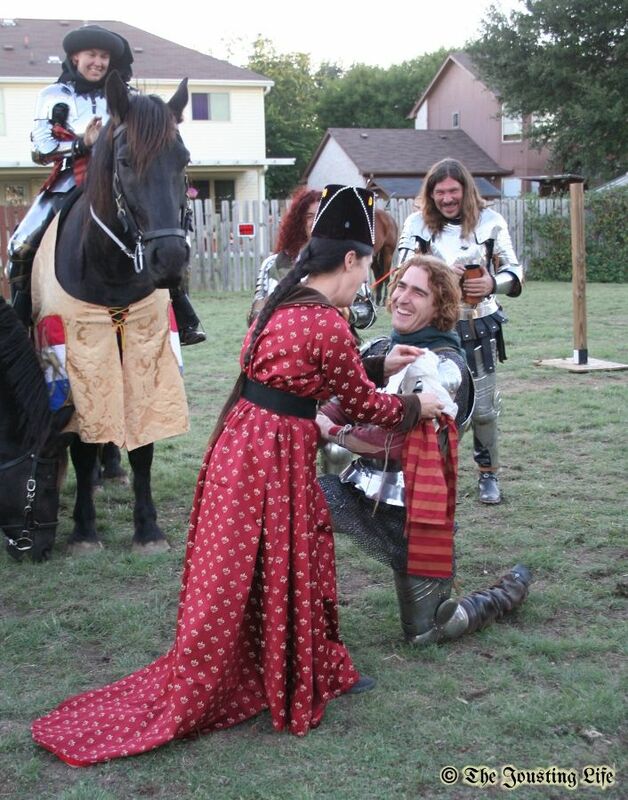 Lady of Honour Dawn Hemphill had the difficult task of choosing who would receive this year's Award of Chivalry. 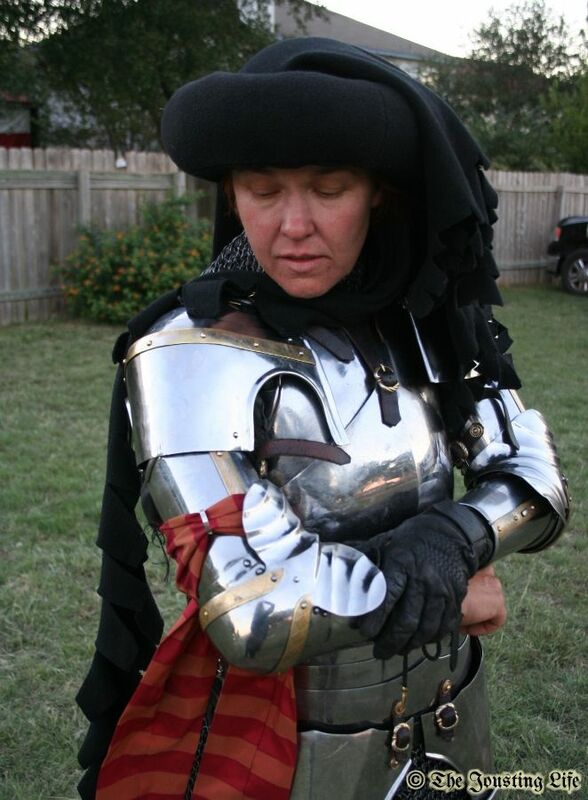 Based on her own observations, as well as statements given to her by jousters, squires, ground crew and anyone else involved in the tournament, Dawn chose Australian jouster Sarah Hay to receive the Award of Chivalry. 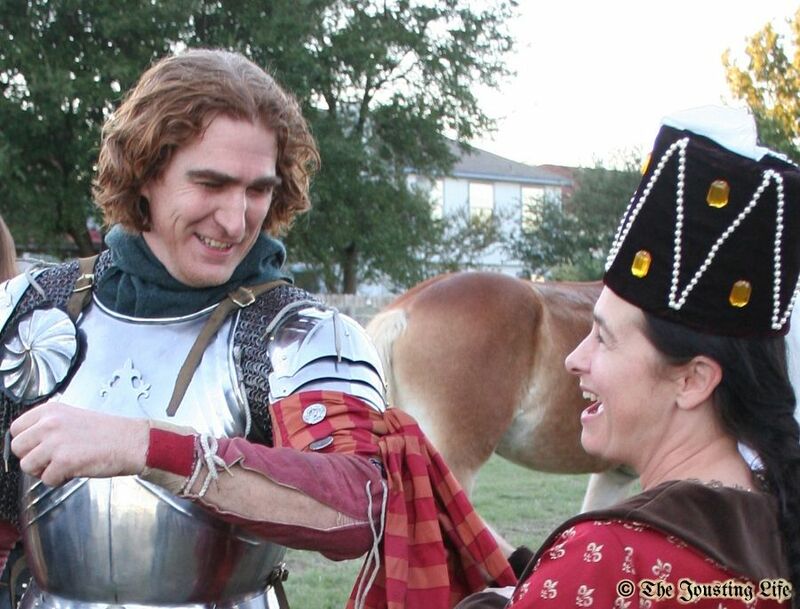 Since bringing one of her own horses from Australia would have been highly impractical, Sarah rode fellow competitor Dave Wise's jousting horse, Ladybug, throughout the tournament. Congratulations to Jeffrey Basham, Dave Wise, Sarah Hay and to everyone who participated in this year's "Lysts on the Lake"! You can see close up pictures of the tournament prizes in the article "DeSignet International Designs Custom Prizes for 'Lysts on the Lake 2013'"
More pictures and video from "Lysts on the Lake 2013" will be presented as they are processed.